I was recently back up in Glasgow for a wee bit, so I thought I'd share one of its treasures. Not exactly a hidden gem, this, but it's actually better than you might think: The Kibble Palace. The Kibble Palace is, in its technical execution and its spatial quality, the late peak in the development of glass-and-iron filigree work. The idea of the crystal palace, the enclosure of space by a transparent shell, is embodied here with a radicalism that has no equal. Not only were the existing technical possibilities exhausted, but a new standard of industrialised building construction was set. Gosh, high praise indeed! It almost makes one wonder whether the stage for future investigations was perhaps set by having such an exquisite example of the iron and glass art so close to hand all throughout growing up. Domed glass-houses, based upon a system invented by a chap called Loudon, are often the most perfect examples of the art due to the fact that the glass itself starts to take lateral loads, turning a vaulted structure into a shell, meaning that it can become so reduced as to be almost intangible. For an example of just how lovely it is, have a look at the way the different curvatures of the passageway meet the wings and the dome... puts the digerati to shame! 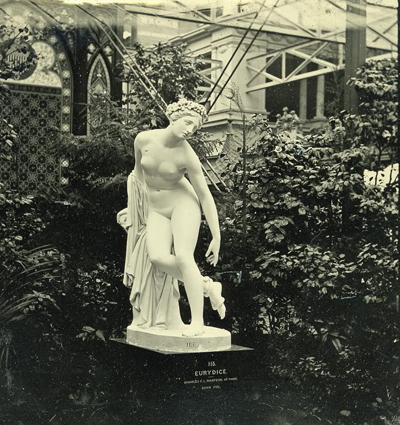 And no glasshouse would be quite complete without a selection of ever-so-slightly lascivious marble nudes. ... and of course melancholy.